We at The Conservation Foundation are honored to have received the Forestry Outreach Award from the Chicago Region Trees Initiative (CRTI) for "efforts in preserving and restoring land, coordinating the Conservation@Home program in Northeast Illinois, and for considerable work on oak tree establishment and private landowner outreach in the Big Rock Creek watershed." 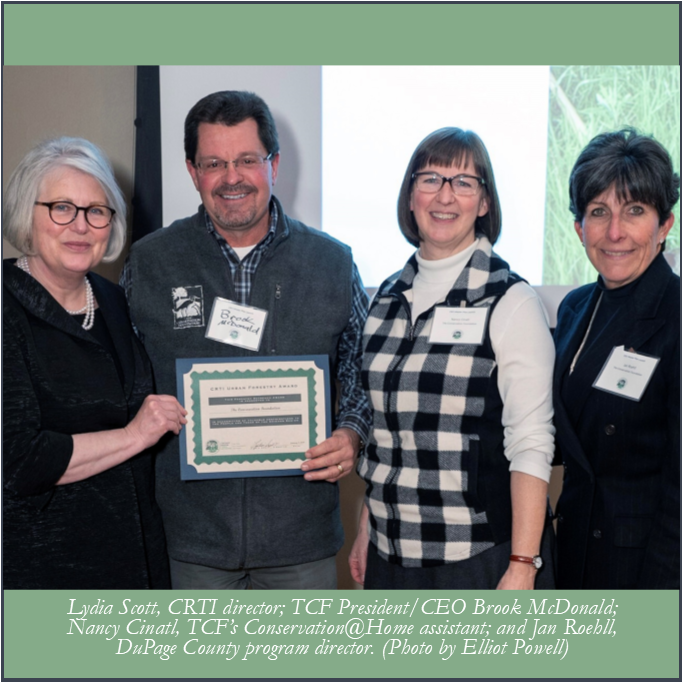 The CRTI Urban Forestry Awards, presented at the organization’s fifth annual Partner Recognition Celebration, recognize people, public and private organizations, and communities that are leaders in protecting, expanding and enhancing the tree canopy in the Chicago Region. For nearly 47 years, we have been preserving and restoring our landscape in Northeastern Illinois. Our Conservation@Home and Conservation@Work programs were established 12 years ago to promote native landscaping on our suburban landscape so people could invite nature more into their lives, and help with water, pollinator and other environmental challenges, and feel they can make a difference. This always included the planting of native trees and shrubs, especially oaks. These programs have expanded regionally throughout NE IL through a collaborative partnership and now more than 1,000 properties have been certified through the program by all partners. Three years ago, as a way to get more oaks planted on our suburban landscape, staff and volunteers converted the old chicken yard at our McDonald Farm headquarters to a tree nursery complete with an irrigation system paid for and installed by a volunteer. Each spring, an anonymous donor purchases 130 native oaks in 5-gallon buckets for the tree nursery. Each tree, in the bucket, is placed in a hole with an individual drip irrigation source. The volunteer maintains the nursery and trees throughout the year. During the year, mostly in spring and fall, we distribute all of these trees to Conservation@Home/Work participants, volunteers, schools, churches, parks and other locations to get more oaks on the landscape. These are provided free of charge to deserving and appropriate landowners who can demonstrate they will plant them in the right place and take care of them. Information about how to properly plant and care for oaks is included. To encourage community participation in the fall for “Oaktober,” we receive several hundred oak trees from Bartlett Tree Service and use them as part of our Mighty Acorns® programs throughout the region, educating kids about the importance of oaks and trees in our landscape. Many of these oaks end up in parks and forest preserves, in addition to school grounds. Over the past three years, we have distributed more than 1,200 oak trees. We're also working on some outreach in Kane and Kendall counties to landowners with quality oak specimens along Big and Little Rock Creeks, as well as organizing community oak workshops, lectures and tours of private lands where oak woodlands have been restored. We're a proud partner in the CRTI and the Oak Recovery Initiative and are committed to ensuring that our native woodlands are healthy and productive for future generations. Comprising more than 160 partner organizations, the Chicago Region Trees Initiative strives to make the Chicago region the greenest, most livable, and most resilient region in North America, and believes that trees are critical to achieving this vision. Many thanks to the Chicago Region Trees Initiative for all of their stellar work, and for recognizing us in this way! !